Let them gamma-radiated big guns smash. I’m Canadian, so when a member of Alpha Flight is making an appearance in a comic, I’m legally obligated to read it and comment. Now, I’ll say straight up that I doubt most Alpha Flight fans are going to be super happy with the outcome of this issue, but it opens up a world of questions and future possibilities for the Hulk and Sasquatch that I’m intrigued enough to look past my Alpha Flight allegiance and recognize this for the damn good comic it is. If you made it through that intense run-on sentence, let me say very plainly that Al Ewing is a damn good comic book writer. I’m not the biggest Hulk fan (I find the Banner vs. Hulk battle rather tired at this point in my reading journey) but Ewing has thrown a wrench into the mix here with issue #5 that has my full attention. This is not the Hulk I’ve read a thousand times and what the mirror shows in this comic? Well I’ve never seen that angle with Bruce or The Hulk, and I’m always game for a new angle with an iconic character. Ewing knows this is a Hulk comic, so there must be an adequate level of smash. 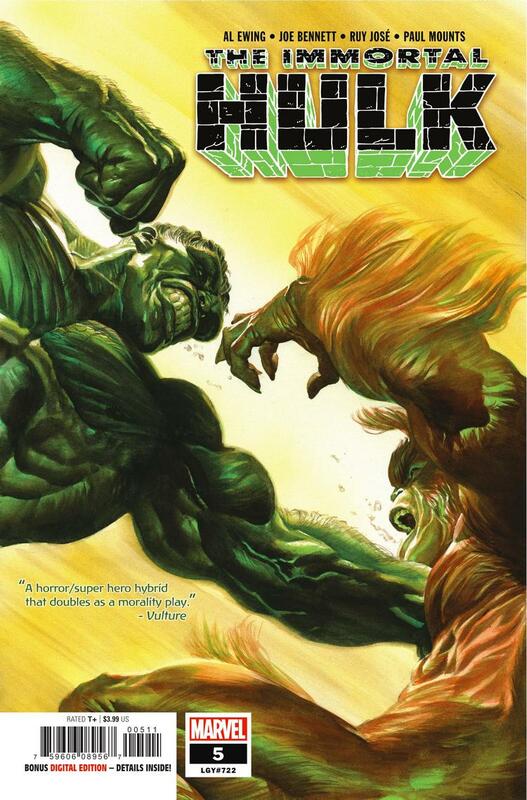 Readers get some serious action with Hulk vs. Sasquatch, and it was nice to see Sasquatch get a few solid rounds in with the Big Green Machine. While the bruisers tango, Ewing lets the real battle unfold – the mental battle – and that’s where the interesting story lies. The two facets of the story weave together nicely, enhancing each other without drowning one another out and the net result here is a damn entertaining Hulk story. Joe Bennett’s pencil work has a classic feel to it, like we’re getting a Kirby-esque Hulk. This take works well, and Ruy Jose’s ink work finishes off the pencils nicely, giving Hulk and Sasquatch a look of classic horror characters at points, like these are truly monsters at work, not heroes brawling. Paul Mounts’ colours provide that signature “Hulk feel” that I look for in a Hulk comic, where the greens steal the show at all times. Cory Petit’s lettering evokes the world shattering power of these titans and their fury explodes from the page. The overall aesthetic of the art conveys the story beautifully, setting a tone that is in alignment with the script and delivering a unique Hulk story that feels like a classic in the making. The Immortal Hulk #5 has twists in it that have me hooked and that’s not an easy thing for me when it comes to a Hulk book. I like the vibe Ewing, Bennett, Jose, Mounts and Petit have going on here and I’ll be back to see where they take this story.